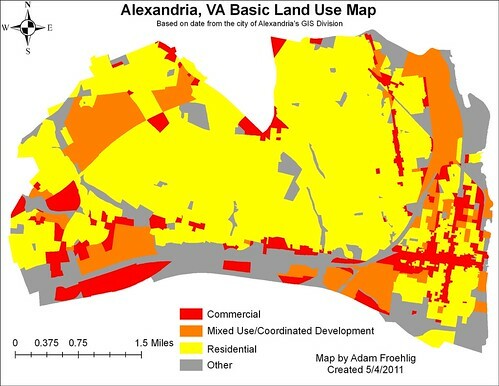 - Alexandria has grant money available to implement 6 Capital Bikeshare stations and pay for 1 year of operations. This is in addition to $400K of FY 2013 CMAQ funding that I tweeted about last week. The first round of stations would be focused on Old Town and Carlyle. The CMAQ funding would go for additional stations, either more in Old Town/Carlyle (for more critical mass) or possibly in Del Ray and/or Potomac Yard. City staff still need to work out both site locations and contracting issues with CaBi, DC, and Arlington, but hope to begin installing stations by next spring. - The BPAC, in coordination with city staff, is looking at doing bicycle/pedestrian counts at various locations in the city in September and possibly also in July, as part of the National Bicycle and Pedestrian Documentation Project. 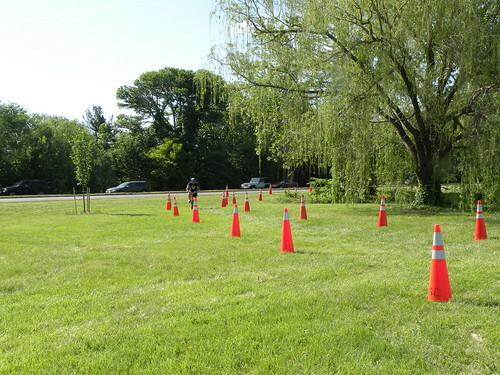 Volunteers will count the number of bicycles and pedestrians that pass by over a 2 hour period on the count day. If you live in or near Alexandria and are interested in volunteering, please let me know. I'll post the official meeting minutes (plus catch up from March and April) once they're available. 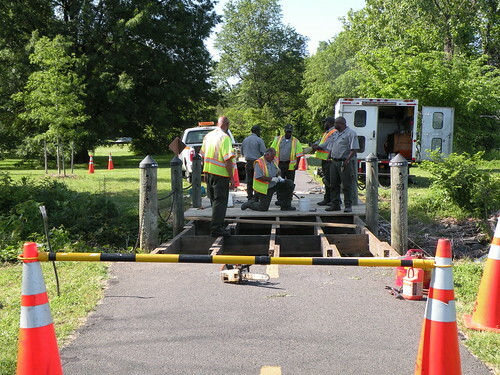 Earlier this morning, the National Park Service had a minor oops on the Mount Vernon Trail, specifically, on one of the trail bridges between Daingerfield Island and Four Mile Run. I chatted with one of them, who mentioned they're working to have the bridge fixed tonight so that it's ready for the morning commute (the MVT gets a lot of bike commuters). 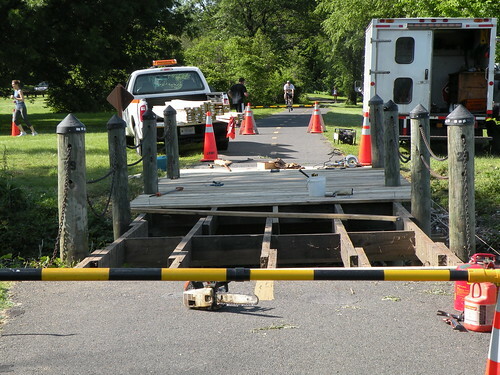 Curiously, the NPS worker also mentioned that NPS plans to replace all the MVT wooden bridges (not already done so) with heavier-duty bridges that can support emergency vehicles (a good idea since this one couldn't even handle a small forklift). A few such bridges have already been replaced down towards Mount Vernon, but the worker didn't know what sort of timeframe we can expect for the rest. What he did mention, though, is that the bridge over Dyke Marsh will be next. Last week, BeyondDC posted a series of thematic maps of DC created using GIS data available from the DC Office of the Chief Technology Officer (OCTO). Maps were created for topography, building footprint, and basic land use. 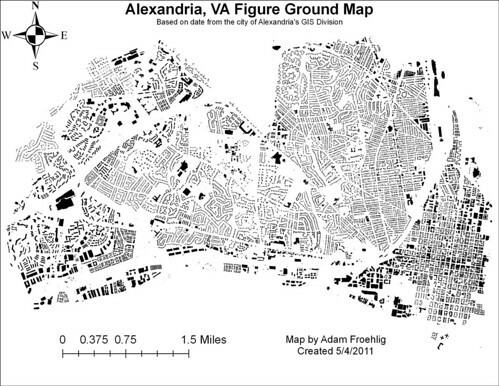 Inspired by that, I created similar maps for Alexandria using data from the city's GIS Division. This map simplifies the city's zoning into four categories: commercial, residential, designated mixed use/"coordinated development" zones, and other (everything else). The commercial corridors along King St, Washington St, and Mt Vernon Ave really stand out on this map, as do the designated mixed-use or "coordinated development" areas that reflect recent development (Carlyle), new development (Potomac Yard), or proposed redevelopment areas (Beauregard). These maps show building footprints. The first one is citywide, while the second one is a zoom-in showing Old Town, Carlyle, Rosemont, and the southern part of Del Ray. While not as "thick" as DC, there is some noticeable density in Old Town. 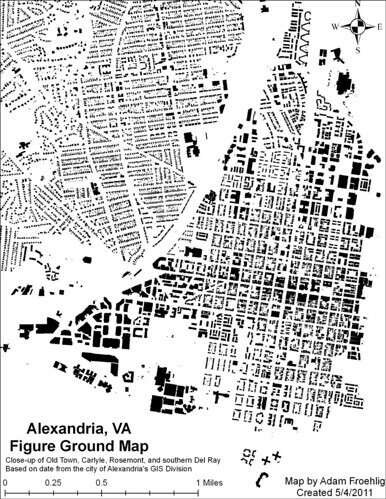 This map details the city's topography, with contours at 10 foot intervals. The highest point in the city is located in Fort Ward Park. Other noted areas of elevation are the ridge along Seminary Rd, the Landmark area, and the far southwestern corner of the city near the Beltway/Van Dorn St interchange (technically outside the city limits but included in the data package). 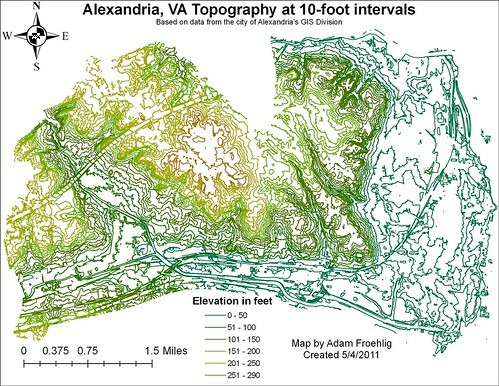 Some man-made and other features can also be easily seen in the topography, including I-395, the Beltway, the Beltway/Telegraph Rd interchange (before the Wilson Bridge-related construction began) and the CSX tracks. Also easily visible are the Cameron Run channel, Holmes Run, Backlick Run, and part of Four Mile Run. The Alexandria City Council approved the city's FY 2012 budget today. The Transportation Add-on tax, discussed often on this blog and in the city's Transportation Commission meetings in the past, was not approved. In its place, City Council approved the equivalent of 2.2 cents of the overall real estate tax rate paid by all property owners be reserved for transportation, with 2 cents of that representing a real increase over FY 2011. It's estimated that this will bring in $13.5 million for FY 2012 and $110 million over a 10 year period. These figures are roughly comparable (within 4%) to what the add-on tax was estimated to bring in. This situation should not be very surprising. The Alexandria Chamber of Commerce has been very vocal in its opposition to the add-on tax, to the point of running a "Vote No Add-on Tax" campaign and collecting close to 500 signatures in an online petition, dwarfing a similar online petition promoted by tax supporters. One of the complaints often heard amongst the business community against the tax is that it would place an unfair, undue burden on one sector of the community to fund projects that benefit the community as a whole. This viewpoint was apparently prominent amongst the City Council's deliberations. The property tax they approved for transportation affects ALL property owners, not just commercial property owners like the add-on tax does. Detailed budget documents are not yet available for viewing online. But given that the property tax dedication to transportation improvements is similar in dollar figures to what was estimated for the add-on tax, there shouldn't be any significant changes to the projects and priorities proposed for funding. Even with the change in source, this tax revenue still allows the city to make targeted transportation improvements that will improve travel in Alexandria.